Every year, Arby's executive chef Neville Craw and his crack team come up with upwards of 1,200 potential new sandwiches. Around 50 of those are developed until release-worthy. Only five or six make it to stores. One of those is the Smokehouse Brisket sandwich. Earlier this month, Arby's invited me to its Atlanta headquarters to convince me that was a good thing. Maybe I am just being paranoid, but the timing was certainly suspicious. Three weeks prior to "Arby's Smokehouse Brisket Blogger Lunch", I had reacted slightly negatively to the components of the restaurant chain's latest sandwich. And then there's the mayonnaise, the ultimate condiment cop-out. 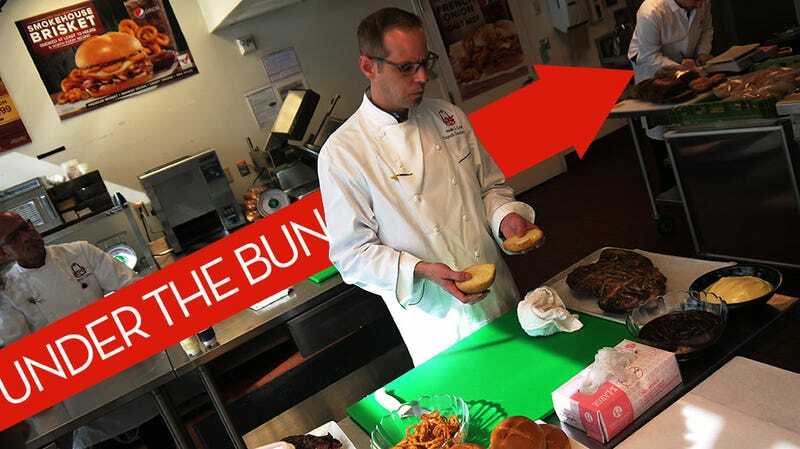 The Arby's food scientist who tasted this sandwich and said, "You know what this really needs? Mayonnaise," should have his taste buds sanded off. Seriously, what the hell? And now there I was, along with a handful of Atlanta area food bloggers, standing in front of the Arby's food scientist who tasted the sandwich and decided it needed mayonnaise. On the table in front of him, a bowl of neatly-sculpted mayonnaise. It probably wasn't a trap. After all, there were other "bloggers" at the event, which took place at Arby's headquarters, conveniently located one exit down highway 400 from my home in Sandy Springs, Georgia. None of the other four or five were 6'6" bearded men with a vendetta against mayonnaise — in fact I was the only male writer there. We were greeted in the lobby with white Arby's aprons and name tags that completely failed to adhere to said aprons, so I couldn't tell you who these other blogging-types were. I can tell you they all seemed excited to be there, in the shiny metal test kitchen, the birthplace of many of the restaurant's once and future things. It was a cozy little gathering. Just some a group of writers, Chef Neville "Crawdaddy" Craw (not his real nickname), Arby's senior vice president of product development and innovation, Len Van Popering, and an army of PR people standing behind us, tweeting like crazy. The test kitchen itself didn't look much different from the back room of an exceptionally clean Arby's location. Ovens, slicers, product posters, a guy off to the side measuring bread — everybody loved bread measuring guy. He wasn't part of the presentation. He was just there, measuring bread for quality assurance purposes. He didn't tweet once the whole time. Once we were all gathered, the selling of the Arby's Smokehouse Brisket commenced. As Van Popering tells it, the Smokehouse Brisket sandwich was conceptualized as a conduit of smokey flavor. The idea started with roast beef, but switched to 13-hour smoked brisket when they realized roast beef wasn't cutting it. From there, they looked at various options, including just the brisket on a bun with various sauces — I'm pretty sure he was paraphrasing my review at that point. Then they took it in the opposite direction, creating a fully-loaded sandwich and narrowing it down to key ingredients through internal and consumer testing. That seems to have worked out, as the Smokehouse Brisket is on track to being one of the most successful product launches in Arby's 49-year history. The end product is smoked brisket, barbecue sauce, crispy onions, smoked gouda, a bun, and of course, mayonnaise. Mayonnaise, mentioned several times during the presentation, was my biggest problem with the sandwich. It had no place on a barbecue brisket sandwich. The chef's counter? This is not a barbecue sandwich. This is a smokehouse sandwich, and each ingredient serves a purpose. How did he put it? Let me see if I can find my tweet from the event. I was skeptical, so when it came time to build my own sandwich, I left the mayonnaise off. I would have video of the creation of my sandwich, but the fellow blogger turned it off accidentally, turning it on when the recording should have finished. I do, however, have a picture. So how was the Smokehouse Brisket without mayo? Not good, though it wasn't because of a lack of flavor delivery. It was an overall lack of viscosity — without the mayo, this is a very dry sandwich. So dry I could barely swallow it. There's just too much brisket and not enough barbecue sauce to ease it on down my throat. The mayonnaise is completely necessary for the sandwich to work at all. So you win, Arby's, though perhaps not for the reason you might prefer. The rest of the visit consisted of what i assumed was lunch but was actually more of a tasting — there's a big difference. Our group was escorted to the top floor of the building, into a board room with an excellent view of the Perimeter Mall area. Then we were handed menus. Not a regular menu, mind you, where you make a selection. It was a menu of what was coming. I was not prepared. First, a Smokehouse Brisket with both fries and onion rings. Second course, one Arby's new King's Hawaiian Roast Beef sandwiches. Swiss cheese, pickles and Dijon sauce were much more than the sandwich needed, just like course four, a molten chocolate lava cake, was far too much for me to handle. We were supposed to take small bites, but that's not how I was raised. As Van Popering talked about the company's pride in serving health, unique fast food and commercials (eventually) played on the board room screen, I concentrated on being the plate-cleaner I was taught to be. In retrospect, I am never eating anything ever again. Ever.